The easiest way to unmount a drive in OS X is to either just drag a volume into the Trash, use the eject keys, disconnect the drive, or use one of the force eject methods. Along the same lines, if you want to remount a drive you can usually just physically unplug the drive and plug it back again. But what if you want to be able to mount, unmount, and remount drives from the command line? That’s exactly what we’ll cover here. This trick works with external USB disks, hard drives, Firewire, Thunderbolt, DVD’s, CD’s, network drives, even USB thumb drives, literally any volume that can be mounted and accessed through the incredibly helpful diskutil command. By using the command line to remount the drive, the entire process can be completed remotely if necessary through SSH, and without ever having to physically disconnect a drive from the Mac. This is infinitely useful for troubleshooting situations, for scripting and automation, and it’s a great trick for those of us who just like to tinker around in Terminal. Let’s first cover unmounting drives. To do this you’ll need another volume attached or connected to the Mac in some form or another, then launch Terminal to get started (sits in /Applications/Utilities/). For the sake of this example, we’ll focus on the attached drive named “OSXDaily”, which happens to be an external USB thumb drive that appears last in the list. Note the identifier for that drive is “disk1s2” and we’ll carry that to the next series of commands to unmount and remount it. It’s probably worth mentioning that drives will always be located in /dev/ and thus /dev/ will always be prefixed to the identifier. Still using the diskutil command, we’ll point it at the drive in question to unmount. That’s all there is to it. You’ll notice the drive is no longer accessible in Finder, but it will still be visible through diskutil from the command line, or the more familiar Disk Utility app in OS X’s GUI. If you can unmount a drive, of course you can mount or remount one too. The command sequence is very similar; locate the volume, then mount the drive. That output is obviously much shorter than the full output of diskutil list which we showed above. For this example, the drive “OSXDaily” is still located at /dev/disk1s2 and that’s what we’ll mount. This obviously mounts the drive again, and it will also make the mounted volume visible again in the OS X Finder and to GUI-based apps in the various Open or Save dialog boxes. If you happened to be watching the volume in the Finder during this process, you would find it to disappear briefly, then reappear almost immediately. The last echo portion is optional but it makes the entire command action even more verbose. Pretty good help. I need the next step, though. I am having the same issue. Did you find anything out? Same thing. How did you resolve this? My external HD was disconnected accidentally and it wouldn’t show up on my desktop, only on my disk utility while blinking rapidly. The HD under the indented section on the left panel would be in grey. When I ran “verify disk” and “repair” it said it couldn’t be repaired and needed to be repaired. 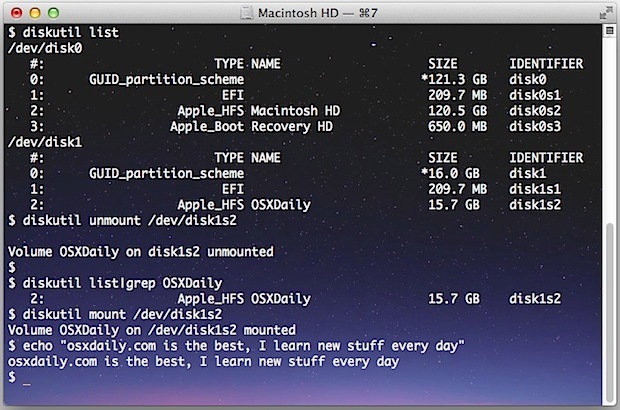 -restart the computer while the external HD is plugged in, and repeat the disk utility step. Nothing worked until I tried the most crude method mentioned on the forum as my last resort: shut down the computer manually(close all apps, press down the power button until it shuts off) with the external HD still plugged in, then started it back up and it worked! Hope this is helpful. Thanks a bunch Xira!! Your method is the only thing that worked. A friendly interweb hi-five to ya! I’m able to mount my external OWC FW800 drives using Apple’s Disk Utility. It seems to unmount a mount my USB3.0 thumb drive also. OMG. This is the best tip I’ve found. I would have died if I lost everything on my external hard drive. You saved my HD many times because of this tip alone. I’ve have people pull out my HD without ejecting it properly…sometimes I do too…and my Adata HD always unmounts itself. What if the disk fails to mount? Use diskutil list to see where the drive is mounted, its not mounting because it can’t be found, you’re pointing it at the wrong thing. Therefore, I have no idea what to be pointing it at…any ideas? What am I doing wrong or what is the issue? I need mount disk1s2. It is an external HDD with an Apple file system. I am trying to retrieve my personal data. It crashed due to the Yosemite upgrade. I have the same problem!!! I’ve already put all of my files on the drive from the same laptop. The SSD is a faint gray color in the disk utility :( Won’t mount! My external drive won’t unmount, says it’s busy????? My external drive is now greyed out in Disk Utility (though the repair function works and says the disk is OK). The disk permissions option is missing. How do you get “permission” to mount the disk. Nothing seems to work. Also, it shows up in my disk utility in grey. Is there a way to at least get the files off of it if it is damaged? Hi in terminal reply comes that disk1 mounted “it is the 1st partition” in my external hard disk but it fails to mount the 2nd partition. also I don’t see the partitions in the disk utility, I want to format the 2nd partition OS X Journaled for time machine backup. Strange issue. Name of drive’s identifier does not appear! Help, anyone! I can report about the same thing here. — 1 TB WD My Passport, + El Capitan. Greyed out, unmountable. No disk identifier! Is this one of the problems that I hear rumors about w/r/t El Capitan problems. Come to think of it, the other issue is with MOTU audio interfaces, so maybe there is a major USB issue? This saved my Harddisk it wouldt come up at finder only disk utility. Hi, thanks for this! when i type diskutil list, i see 2 hard drives and my ssd. I do not see the external dvd writer listed. I do see it under disc burning and I can see the player with toast but cannot mount anything, data or dvd discs. How can toast see it but not any other apps? I tried the csrutil disable but still dont get discs mounted. In the “power cycling” part, instead of using ; at the end of the command, use &&, which makes sure that the previous command is successful before doing the next command(so you don’t mount the drive while it is already mounted, etc). tried terminal command to mount disk that i cannot mount with disk utility. but looks like this is basically the same thing as using disk utility. basically same result: terminal says: “Unable to find disk for …” That disk is greyed out in Disk Utility. DU says to repair disk and then try mounting again. But repair returns/fixes no errors. but disk still wont mount. oddly, it was just mounted on a different computer. i shut that computer down, to move disk to a different computer; and suddenly it stopped mounting. This definitely does work, it just takes some time. If the light on your hard drive is blinking or you can hear the motor spinning, that means you Mac is trying to read it. It may time out, so you have to continue to prompt the disk utility to unmount, even if it says that the disk is already unmounted. Mine finally unmounted after about ten tries. Then I typed the command to mount and it did. You have to be patient and stay at it. Remember that you are working with a machine. To unmount you don’t need to find the /dev/disk… name: just use the /Volumes/whatever name. Could you explain the second mount script and how it could may run in terminal. ” hdiutil eject /Volumes/LaCie ” works in terminal but I cant replicate the mount part. If you connect a damaged disk, and the light indicates heavy activity but the OS does not immediately complain or appear to mount the disk, it is likely running fsck in the background. In my case, I noticed that fsck was going through an error/repair/recheck loop continuously, and not fixing the problem. However, after a very long time it would sometimes mount the disk in read-only mode, and tell me that the disk could not be repaired and I should copy files I needed as soon as possible. I found that if I killed the fsck process, it would skip right to mounting it as read-only (which, if you have a damaged disk, is probably the best you can hope for). Hopefully this helps someone, because I was looking for a way to cut off the useless repair process and just mount it read-only, but the “diskutil mount readOnly” wouldn’t work if fsck was busy operating on the disk. Great advice – found the fsck process in Activity Monitor, killed it and very shortly after, the drive mounted. I just had the same problem. Time machine external became unmountable in (running El Capitan) but I also tried it on a different mac running Leopard (yes,) still didn’t mount. Tried disk repair, tried First Aid. It would say all good, but the drive would NOT mount. I could see it in Disk Utility (on both OS’s). Even tried terminal, and force mount on terminal and it’d give me the whole try Read Only mount –also didn’t work. Called Apple and THEY couldn’t help either (after asking me if i tried everything -which I had) So I bit the bullet and bought DiskWarrior for $128 and crossed my fingers. IT WORKED. It could access the drive and instead of rebuilding the drive’s directory I made it copy my files to a new external. Doing it now. (SIGH…..) months and months of files saved. I should also add – DiskWarrior was the first program I tried. I read not so great reviews on others, but I’m glad the first one worked. My WD external hard drive wasn’t showing up in finder but worked in my PS4. I simply followed the instructions and it worked. Is it advisable to do “diskutil unmountDisk”? I am afraid to do that because what will happen to the internal drives if I do the “diskutil unmountDisk”? Too complicated! Can you be more specific, step by step & explain more of the tech vocabulary for us non-techies? We need help, too!! The command line approach to mounting and unmounting drives is intended for techies, of course it is complicated. If you’re not comfortable with the command line, don’t use it. There is no requirement to use the command line for anything at all on the Mac. Novice users can eject a disk through the Finder, or plug it into USB and mount it that way. Thank you so much, mounted my disc and able to copy everything off.